The ISEE Verbal Reasoning section is the first of the test’s five sections. The level of difficulty differs depending on grade group. Discover more about the ISEE Verbal Reasoning section, and how you can prepare your child for the test. View All ISEE Levels Here! There are two different types of questions on the ISEE Verbal Reasoning section: synonyms and sentence completion. Both of these types of questions assess reasoning ability and vocabulary knowledge. The ISEE vocabulary words chosen for each test are based on whether the exam is for upper, middle, or lower level. Synonym questions concentrate on word recognition, as the answer must have the same (or similar) meaning to the word presented in the question. The synonym questions present a word, and then four answer choices, one of which is synonymous with the initial word. This question type assesses reasoning abilities, as the student must select the answer choice with the most similar meaning to the word provided in the question. The correct answer is (D) — pretense. Affectation is a noun that means "pretended behavior in order to make an impression". Answer (A), expulsion, means "banishing", so it is not the correct answer. Answer (B), fondness, was included as a distracting answer choice since it is a synonym for "affection", which may be confused with affectation. It is therefore not the correct answer. Answer (C), persuasion, means either (1) "the act of influencing someone to do or believe something", (2) "a deeply held belief", (3) "a group that believes in something", or (4) "a kind" or "sort". While one could use affectation (pretending) as a means to persuade, the two words do not have the same meaning, so it is not the correct answer. Answer (D), pretense, means "false behavior" or "cover." It is the closest in meaning to affectation, and is therefore the correct answer. Sentence completion questions evaluate one’s ability to comprehend the meanings of words and their respective functions. In ISEE Sentence Completion questions, a sentence is provided with one or two blanks, requiring the test-taker to complete it with the right word(s). The answer should appropriately and logically completes the sentence. Some of the sentence completion questions on the ISEE Lower Level may call for a phrase as the answer, as opposed to just one word. The correct answer is (A) — deigned. He considered (thought) himself so high above his peers (associates or equals) that he rarely deigned to speak to them more than was absolutely necessary (needed). In this sentence we have several clues. "Rarely" tells of something that does not happen often. "Any more than necessary" also gives this impression. Lastly, if the person considered himself above his peers it means that he was probably not enthusiastic to speak with them. The missing word should reflect this idea. 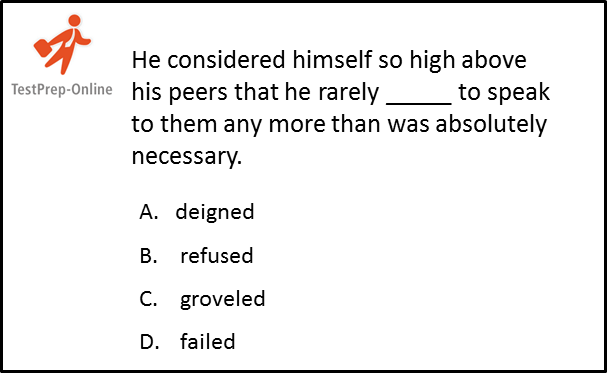 Answer (B), refused, is not a logical answer because if he rarely refused, he talked to them often. The same goes for answer (D), failed. As for answer (C), to grovel means to "humble or demean oneself to a great extent, as in fear". It is an extreme verb and therefore not suitable here. Answer (A), deigned, means "condescend to give or to grant", and is therefore the correct answer. On the test, there will be words that are easier for your child and words that are harder. A good strategy for your child to adopt is to first answer the questions with words that s/he does know, and then return to the questions with the less familiar ones. If your child is still unsure what the answer is, he or she should use the rest of the test time coming up with best guesses. Even if your child does not know the answer at all, it is a good idea to guess on the ISEE, as points are not deducted for incorrect answers. Below are some section-specific tips your child may find useful. Consider the first word that comes to mind when reading the word presented in the question; then look for that word, or a similar word, in the answer choices. The vocabulary words in the answer options are presented in alphabetical order, so don’t fall into the “I haven’t chosen option A/B/C for a while–maybe it’s that one!” trap. Read the question slowly. As seen in our earlier sample question with the words affectation and affection, a misread word can lead to choosing the wrong answer. It is, therefore, important to read the word carefully, and even a second time, before choosing an answer. Study word roots; keep them in mind during the test. Many roots can be a telling sign of a word’s definition. The root psych-, for instance, comes from Greek, and refers to factors relating to the mind and human consciousness. As we see, the words psychology, psychotic, and even psychometric, all connect to the human mind in one way or another. Use the process of elimination. If you do not know the answer, try to focus on what you do know- for instance, what is not the answer. Very often, the process of cancelling out the wrong answers can lead you to the right one (or, at the very least, decrease the amount of options you have to guess from). Read each sentence thoroughly and focus on keywords. This will unlock factors such as tone and message, which will help you to figure out the correct answer. Think of an answer on your own, and imagine it in the place of the blank. After you have done so, look at the answer choices and find the answer that has the most similar meaning to yours. Gather clues through connection words. Words like if, therefore, because, since, and although are meant to help you determine relationships in the sentence. Make sure not to overlook them. Be sure to read the whole sentence again after selecting an answer. This is to make sure that the sentence makes sense; If it sounds awkward or illogical, try another option. Help your child prepare for the ISEE Verbal Reasoning section with TestPrep-Online! We offer a variety of ISEE practice test packs, which help you prepare for the ISEE Verbal Reasoning, by providing special focus on ISEE Synonyms, ISEE Vocabulary, and ISEE Sentence Completion. The ISEE practice test packs include realistic practice tests as well as helpful tips, allowing your child to become familiar with the test structure. Help your child start preparing for the ISEE test today!